*DISCLAIMER* This is just my personal experience, and the tips I offer are just general guidelines after a lot of research and after completing my own detox. I am not a doctor. You should see a doctor before starting a cleanse or detox. I wrote about the first few days of my juice cleanse last week and today I wanted to do a recap of the whole experience overall, in case anyone out there is interested in trying one. The juice cleanse turned into a 5 day detox - where towards the last few days I mixed in smoothies and some real food. I used my green drink recipe for the first day (sometimes adding mint/basil), then omitted the apple and just used half a lemon to cut down on sugar (this is all explained in my first post about juicing). I also switched up the green base- the recipe calls for spinach, but sometimes I used chard (highly recommended, it's very light), arugula (extremely bitter) or romaine (also light). I would've liked to use fresh kale, but I couldn't find any at the store. The coconut water was recommended for anyone doing a juice cleanse, but then I read that it contained a lot of natural sugar, so I ditched it for the other four days. 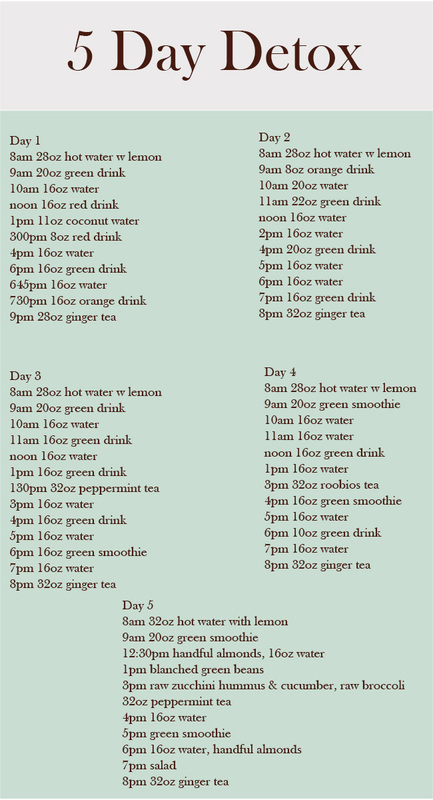 The orange drink recipe and beet drink recipe were used on day one and morning of day two, but then I focused on greens because I wanted to get away from the starchy veggies (carrots) and the sugar content in the fruit. The green smoothie recipe was used on the rest of the days, though I varied the green base between frozen kale and frozen spinach (if you use frozen veggies, you don't need the ice cubes the recipe calls for). I also used a quarter of an apple instead of the whole thing, and half a lemon to cut down on sugar. I made a homemade ginger tea (so easy, post coming soon) and enjoyed that each night, as it's got a little spicy kick to it. When I had those almonds? Ohhhh baby. It was like tasting an almond for the first time. The flavor was so intense! Same with the other "real" food. Flavor explosion, I tell you. So why did I not stick to juices? The answer is simple. I would've liked to, but I a) have a hard time finding a variety of green bases for juicing here in Germany, and b) I needed to build my energy level back up because I'm going to an intense yoga workshop at the end of the week. -I felt really good. It is hard to explain, but I felt light, clean, and rejuvenated. -Enough energy to do 45 min walks every day. -Not as much energy as usual - I couldn't do a vigorous workout. I would imagine that if you are doing this during the work week, make sure that you either have an easy workload or have the type of job where you don't have to expend a lot of energy. I couldn't do this when I was teaching in the middle school. -Dealt with cravings. I didn't have withdrawals (which I talked about in the post last week), but I did miss chewing. I snack when I watch a show or when I read, and I missed crunching on something. I tried all natural gum (apparently that's "allowed" on a detox), but it pretty much tasted like cardboard. -Day 2 is the worst. I was irritable for about 30 minutes. Nothing too crazy, but just kind of on edge. The juices kept me full, but I still felt "empty," if that makes any sense to you. It made no sense to me, which added to my irritability. Eating is emotional for a lot of us, so you might have some sort of emotional reaction - or you might not - just something to keep in the back of your head. Absolutely. I'd like to try again in a few months, and maybe if I don't have something to prepare for I'll stick to just juices. The biggest piece of advice I can give is to be honest with yourself. What is it that you want to achieve? What is your diet currently like? If you eat a lot of sugar/processed foods/meat, you should probably do a 7-10 day (or even longer if you've been off track for a while) diet change to prepare, eating simple foods - veggies, fruit, no refined sugar, no processed foods, nothing too hard to digest. After that, you can start your cleanse and hopefully that diet change will have prepared your body so it won't go into shock when you start the cleanse. When you start eating again, slowly reintroduce foods either in the form of smoothies, or easily digestible foods. You don't want to shock your body! Also, listen to your body. If you feel hungry, drink more juice. If it's truly awful, go to smoothies if you have to. A lot of our lives revolve around food, so I personally think it's best to avoid gatherings with friends during this time because you'll be tempted to break the cleanse (and you may not have the energy in the first place). Instead, take short walks, bike rides, or swimming. Do gentle yoga, read, write, watch a tv show. I also think it's important to keep a journal of your experience - first, to make sure you're getting enough juice/water, and secondly, so you can document any changes you feel or see. So what do you think? Would you ever want to do a cleanse? PS- The Yoga Forum just launched! Come join in on the conversation with likeminded people - we chat about everything from chaturangas to chocolates! There's even a place to share recipes!